Since I haven't been able to get online until tonight, and I worked for a while tonight before getting on tonight to update, I wanted to post the updates from Facebook, since I know many of you don't use facebook. Day 2 of round 1...it's been an exhausting day with not a lot of sleep last night so slept in today! Around noon Emily started to break out on her face with a rash and within half hour it got worse! Claritin was given and Sue and I took her to hospital Halloween party and she was crying her toes hurt and feet itch! So Benadryl was given! Ch14.18 caused a bad bout of pain so they upped the morphine and we questioned neurotonin! So we started that! Bout 2 hours ago she has a fever of 101.3, they want the ch14.18 to keep going so we will watch her temp! Emily seems ok, please hope the rest of evening while running she is ok! We are all exhausted! It has been a long day here with fevers, stomach pain, itching from rashes and the peripheral line stopped working! 3 times it took to get a new line and then needing the GM-CSF shot, so it's been a long day! 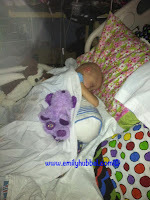 Emily is asleep now with morphine, Benadryl and Tylenol dose and ch14.18 started a little ago! We hope for a night of no pain and anymore rashes! Day 3 of antibodies will end around 505am with morphine running until 705am! Emily has done ok tonight except for itching pretty badly which was driving her crazy and had some pain in her toes, but after that seems ok hopefully we are on top of the pain now! She has had some swelling in her hands, toes and feet and some in her face and slight fevers again! Sorry for no updates on the blog but have not been able to log on to sign in with low signal here past couple days on computer so hopefully tomorrow! ( Or may try to update on iphone) Please hope rest of night continues to go with little to no pain! Day 4 of round 2 started around 440 pm and Emily has had quite a bit if tummy pain tonight! Thankfully itching hasn't been as bad but the pain in her tummy has been hurting! She really hasn't been up for much during the day just been pretty tired and irritable! Fever was 100.7, anything over 101 they will draw cultures when the ch14.18 finishes in the morning and then she will have to stay for 24 for negative cultures! Send positive thoughts for no fever over 101 and no more pain! Emily did need a blood transfusion today since her hemoglobin dropped to 7.4 so, they were hoping this would help with some of her energy during the day. Her platelets are at 28 so they will do another CBC in the morning after the CH14.18 stops to see how things look. Depending on how things look, she may need platelets. 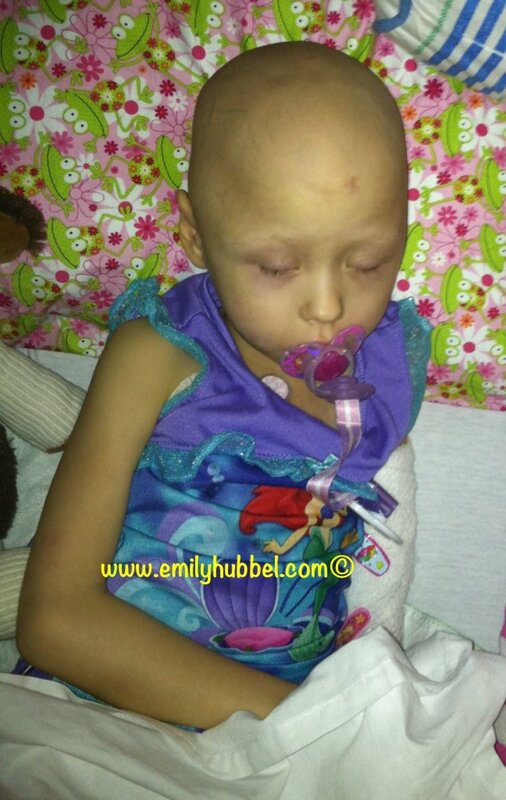 Emily is on an antibiotic, cephaphim, because of fever from earlier in the week. However the cultures that were ran were negative. Emily received a bolus of morphine because they have to stop the drip to give the antibiotic, about 10 minutes into the the antibiotic, Emily was screaming in pain because her stomach was hurting so badly. Another bolus of morpine was given and she finally settled down to sleep and is calm. We learned that we can't give her benadryl through her peripheral line because it burns so badly that she cries. So they are going to just give her benadryl via oral from now on. The band aid drive is really taking off, thank you so much. All over Massachussetts people are helping to my sister in law Tricia and Michelle to others in the area wanting to help, all the way in Grand Rapids with Ashley all the way to Pittsburgh, PA and then all the way back here in VA with Karen putting it at the daycare and her work and Emily's school wanting to get involved. (Im sorry if I left you out, but we are in just complete awe of all the people wanting to help with this band aid drive and see this make a HUGE success!!!) AMAZING and a huge THANK YOU.. Thank you to our friend Heather for starting Encouragement Cards for Emily event on facebook just to make her smile. She is going to love all the cards when she is home and seeing all the love from everyone. Thank you! Thank you also Heather for the bag of love you sent to Emily today via Sue, you put a smile on Emily's face. Thank you to Mrs. Tetlow for stopping by to see Emily yesterday, she is sorry she missed you since she was sleeping, but she really loved the cards the kids mad her and the pillow case with all of her friends names on it. Thank you Mrs. Tetlows class, you guys are so awesome. Emily misses all of you. Hopefully Emily doesn't get a fever over 101, because if she does, they will do cultures in the morning after the CH14.18 and then she will have to stay for 24 hours to make sure it is negative. NO FEVER, STAY AWAY, we are all ready for homebound. Homebound would be awesome right about now, because sleep doesn't really happen much here with all the beeping, all the nurses and worrying about Emily! A huge thank you to Sue and Jojo. They have been a huge lifesend to us this week, they really have. Thank you! Sue has been taking Anna to school in the morning, being at bedside with Emily and I during the day, heading home and making dinner and having it ready for Daddy to bring it in the evening for us to have. THANK YOU. Jojo has been home, helping with Anna too, you guys are just totally amazing. Emily has really liked having Sue here and even asking for her and doesn't want them to go home Saturday morning. So, thank you Sue and Jojo for staying until Sunday, you guys are awesome. If no fever, tomorrow we will pick up Accutane, Neurotonin and Emla cream from the VCU pharmacy and should be home tomorrow afternoon sometime. Emily will remain on the GM-CSF shot through 10/25. She has clinic on Tuesday to check labs, triglicerides and a few other things and if everythign looks ok, she will start her accutane that day until 11/5. 11/5 is her next inpatient day for the start of Round 2. She may also have to go home on benadryl for itching, but we can handle that. If she has low grade fevers, she can take tylenol at home. Hopefully after 24 hours at home, her energy level will pick up and the irritability will not be as bad and she won't feel so exhausted. We hate seeing her in pain and looking so sad, we really do. Thank you again to everyone and all of your awesomeness, it really does mean a lot to us. Thank you! Make sure you hug and kiss your kids goodnight and tell them how much you love them. Love you Jessie, Emily and Brianna. Good Night.